Dude, let’s order up some pizza! We’ve been looking for out-of-favor brands since ATG launched. Some businesses are driven by management, some by macro trends, some by innovation, etc… There are a lot of reasons why a business can excel; a resurgence of a brand is one of those reasons. What better way to turn a brand around than a new global advertising campaign? I’m always on the look out for new ad campaigns that could turn things around. In this case I’m going to be talking about pizza. As a lactose intolerant man, and a New Yorker, I’m not the global pizza brand customer. But I know there are three major players in the industry: Pizza Hut, Domino’s, and Papa John’s. There are some secondary brands (Little Ceasers, CiCi, etc…) and then there are mom and pop shops. Pizza isn’t a new category, nor is it going out of favor. What drives the success of these companies versus the rest of the industry is branding, new products, and global/national food trends. I really like the new Pizza Hut redesign. 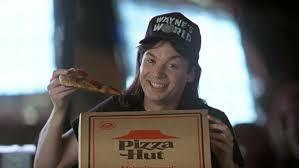 Pizza Hut built its brand on the red roof stores, which was targeted towards eat-in customers. As pizza consumption moved to delivery, the eat-in business suffered, and stores built for eat-in customers were not a good use of capital. Pizza Hut has been on the decline for some time. Same-store-sales have been negative for 8 quarters in a row. So what’s going to change? They are rebranding. I like the focus on pizza sauces. I like the spirals. I like the new logo. I think both Papa John’s and Domino’s have been running long term campaigns, which I like, but have been on for years. Even good campaigns can lose their impact after a few years. So maybe it’s Pizza Hut’s turn. I have convinced myself I like the ads with grumpy Italians even though a writer I respect recently trashed them. While this isn’t my typical value play, I don’t mind owning a world leader with a side story that could provide some upside.